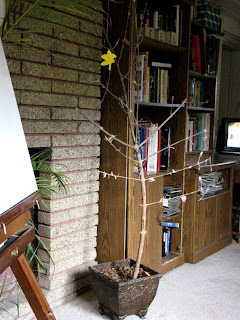 We started a tradition a couple of years ago, our Thanksgiving Tree. 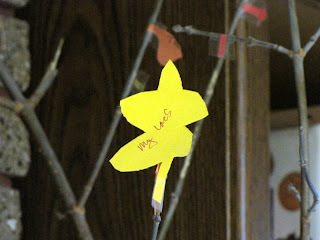 While the original idea was for paper, ours is an actual branch from one of our trees --we use the same one every year. Each of us has our own shape of leaf. Mine is a maple type, Eric's somewhat resembles the Oak, Trev's is oblong, and when I asked Maddie yesterday what shape she'd like, she said "I want a Circle!" Circle it is then. When one is thinking thankfulness, Gratitude can strike at any time, and we're ready for it. We take our time creating our beautiful tree... days or weeks, as time allows. When Thanksgiving is over, we put our Tree in the rafters of our garage for safe-keeping. Yesterday I had Eric drag it down so that we might begin its decorating. 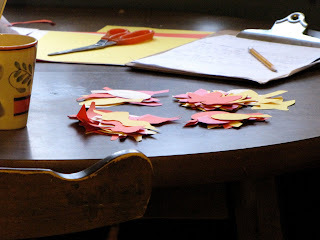 I made templates for our various leaf shapes out of card stock, and preceded to cut several leaves for each of us, so that when Inspiration strikes, we have leaves at the ready. Since I didn't want to miss out on the few leaves that remained of Yesterday's Thankfulness, this morning as I took each leaf off of the tree from the last time, I recorded the things each of us had written on our leaves. It certainly made me smile - remembering, and peeking into the hearts of these Loves of mine. How I love this family of mine. How very, very Thankful I am.